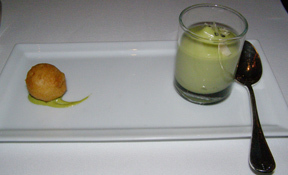 Sophistication, Fun, Incredible Food at a Great Price :: Campton Place, S.F. If you’ve walked by the Campton Place Hotel umpteen million times on your way from the Sutter/Bush parking garage, and never considered dining there, thinking it was completely out of your price range, then have I got great news for you! 1. 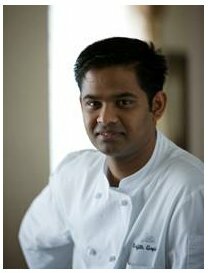 About a year ago they brought Executive Chef Srijith Gopinath, part of the Taj Hotels regime, in to take over the kitchen. Chef Gopinathan was raised in Southern India, where as a child he cooked alongside his mother and grandmother. Deciding that this was the career for him, he attended the Culinary Institute of America, Hyde Park NY, followed by a stint in the kitchens of Raymond Blanc and Gary Jones at the famed Le Manoir aux Quat’ Saisons, Oxford England (a Two Michelin Star Restaurant) and on to an award-winning Mediterranean restaurant in the exotic islands of the Maldives where he wowed the very $$$$ clientele. It’s hard to classify Chef “Sri’s” food since it’s a compilation of his unique background. Let it suffice to say that he incorporates Indian spices and European techniques with farm fresh California ingredients to deliver some of the most impressive looking and tasting food in San Francisco. At a recent dinner I realized after our first little “drink your greens” palate cleanser of avocado, green apple and arugula foam with macadamia nut and a sprinkling of black salt, that were in for a treat. Roasted Baby Beets, “Curd”, Greek Yogurt, Sunflower Sprouts and Balsamic-would win over even non-beet lovers. The beet curd should be packaged and sold to be used as a sandwich spread. Seared Artisan Foie Gras, Rhubarb, Campari, Cardamom Tuile and Pistachio Crumbs- sheer perfection in one smooth decadent bite. Delta Asparagus, Jidori Eggs “Gribiche”, Trotter Croquettes and Hen of the Woods Mushrooms- “designer” ham and eggs. Slow Poached Maine Lobster Tail, David Little Farm Potatoes, Hearts of Palm, Coconut Curry-a perfect preparation. Masami Beef “Wagyu” Beef Rib Eye, Trumpet Mushrooms, Pomme Puree and Sauce Perigord- possibly the best meat dish of the decade! For dessert we had a very fun Popcorn and Peanut and blown sugar dish, followed by a platter of one-bite luxe sweeties. Since the wine list is many pages long i highy recommend that you place yourselves in the competent hands of Master Sommelier, Richard Dean (Tavern on the Green, San Francisco’s Mandarin Oriental), one of only 150 active Master Sommeliers worldwide. His recommendations (selected from Campton’s 10,000-bottle wine cellar ) may roam between the classic and creative but always beautifully harmonize with the Chef’s spice notes. I know that for many dealing with sommeliers can be a wee bit intimidating, however not only is Richard very personable and charming, but he’s also a lot of fun. Which is just one more reason to sign up for one (or all) of Dean’s intimate wine seminars and dinners, featuring a different winemaker, that will be joining you for an informative evening. A little pricey but well worth it for wine-lovers. For more details check out The Wine Scene. And now that I have you salivating, here’s more good news. THE STIMULUS MENU: Campton Place’s contribution to economic recovery. The Stimulus Menu offers three-course dinners for only $45 with selections made daily by Executive Chef Srijith Gopinath. This special menu is offered nightly ( except closed monday) between 6-9:00 pm.